What is Paper Carry Bag Project? The carry Bags & Products such as scripling pads & stationary items are made out of paper instead of using plastics & polythene. Why for paper carry bag project? Due to Polythene and plastic pollution now a days the awareness of using Eco friendly products is been popularized among the people so this kind of projects are need of the hour, in this scenario we have started paper carry bag manufacturing project for the past 6 years ago. How can paper carry bag manufacturing started? Whom can go for this project? 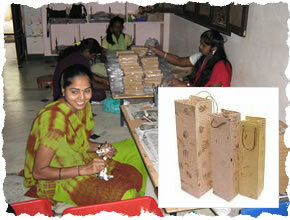 Self help groups, house wives, individuals can start this paper carry bag manufacturing project. Two persons. One is to operate the machinery the other person to paste the bags. Training for paper carry bag manufacturing machinery will be given by our training experts. The papers for manufacturing carry bags will be provided by us and also easily available in the market. The marketing support and guidance will be given by our organization.